A chronological look at the historic landscape of the Mendip Hills, surveying both archaeological and architectural features. Elaine Jamieson is a Research Assistant at the University of Reading. 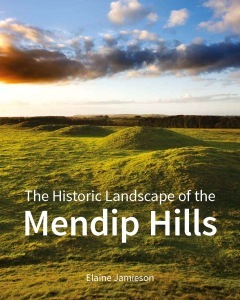 This handsome volume on the Mendip Hills in the series of historic landscapes is much to be welcomed. It is beautifully produced, and well illustrated with large, good-quality photographs, maps, figures and reconstruction drawings of earlier landscape features ... it offers an incomparable overview of a regional archaeology across the 'longue durée'. Historic England records, analyses and presents an attractive overview of the Area of Outstanding Natural Beauty from the Stone Age to the present day, partly to help protect and manage its historic environment and partly to promote public enjoyment. It's a rather gorgeous and richly illustrated volume ... Taken overall the volume is a triumph, and Somerset is luck to have it. Clearly a huge amount of work has gone into it, with support and contributions from a larger than normal range of bodies and individuals.